Windy City's Zoetrocious (center) jams against the L.A. Derby Dolls in the Chicago Invitational. While the Windy City Rollers and their colleagues in the Women's Flat Track Derby Association charge for tickets to see their events, the reality is that none of the competitors actually makes any money. The ticket sales and sponsorships go toward funding the operations of the teams, but derby folks compete for the love of the sport, not for money. However, last weekend's Chicago Invitational brought not only banked track derby to town, but also cash money for the teams that fared the best in the two-day tournament at the Odeum Expo Center. The tournament featured four teams -- the Windy City Rollers, Gotham Girls Roller Derby, the Rocky Mountain Roller Girls and the L.A. Derby Dolls -- that competed for $16,000 in prizes. The winning team would take home $10,000, with second and third place getting $5,000 and $1,000 respectively. The L.A. Derby Dolls were the only team in the tournament with routine experience in banked track derby, but the other teams represented some of the best flat track derby leagues in the nation (in fact, Gotham recently took the WFTDA national championships). On the first night of the tournament, Windy City took on the L.A. Derby Dolls. Unfortunately, they were unable to put up much of a fight against the far more experienced team. The final score was 209-78, which meant the best Windy City could hope for would be the $1,000 consolation prize. During the next bout of the evening, things were a lot more interesting with Gotham narrowly losing out to Rocky Mountain's 5280 Fight Club. Rocky Mountain got out to an early wide lead as Gotham seemed to struggle with the adjustment to the banked track. As the match progressed, Gotham began to fight back. Rocky suffered from a significant number of penalties throughout the second half, leaving them with only six players left by the end of the match. The teams were tied by the last jam, but due to a penalty, Gotham found themselves without a jammer, and Rocky scored the handful of points they needed to claim victory. In the second night of the tournament, Windy City faced off against Gotham to see who would get the consolation prize. Gotham is the current defending national champion in flat track, so once they got used to the quirks of banked track derby, they were set to dominate. Windy City got ahead in the very first jam of the match, but it was largely all downhill from there with a final score of 214-94. Windy City put everything they had into it though, ending the match with an empty bench as the rest of the team had been ejected for accumulation of penalties. 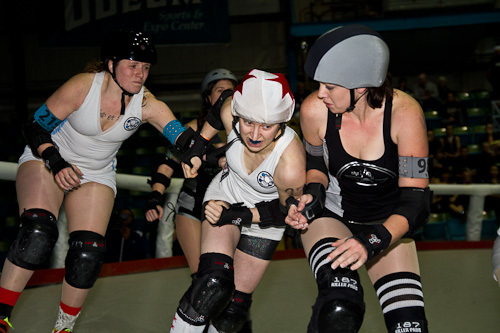 Gotham's star jammer, Susie Hotrod, speeds off in a bout against Windy City. The final match of the tournament featured an amazing battle between Rocky Mountain and LA. Neither side dominated, and there were multiple lead changes throughout. Once again, Rocky Mountain found itself going into the last jam with a tie game, but this time, they were the ones who had their jammer in the penalty box. In the final jam, L.A. was able to pick up the few points they needed to secure the win 113-108 and take home the $10,000 prize.